Oh, I just love Milo's sweet face and this adorable layout. 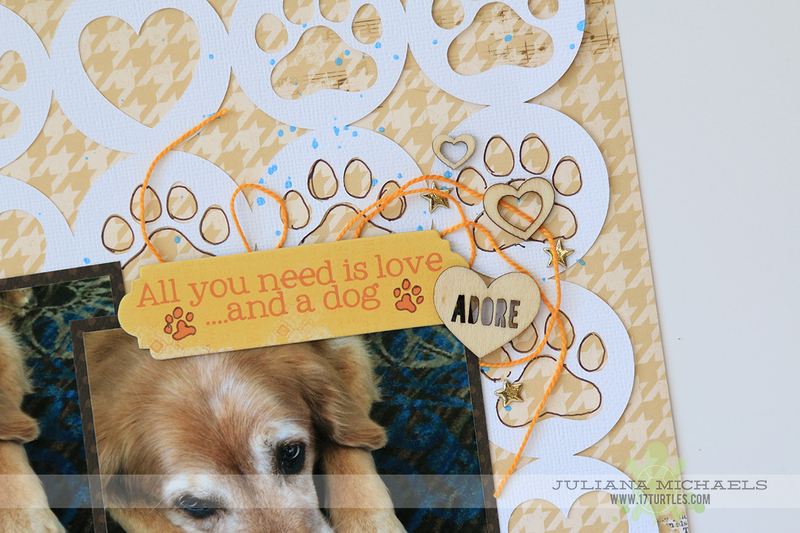 That paw print and hearts background really makes the layout sing! Thanks for the chance to win a mystery prize...I love mysteries! My favorite scrapbook product right now is probably journaling cards and Project Life cards. I am a very simple scrapper and have been trying to streamline! Nothing like Puppy Love and golden retrievers are the sweetest! Love your stitching! My favorite scrapbook product is my Silhouette-I love being able to make embellishments and backgrounds for my pages. Thanks for sharing your creation of Milo. I love this page. I might steal it ...I mean copy....to scrap my pictures of my dog, Cody. Right now I am loving these whole page files to cut out with my Silhouette, they make backgrounds for scrapping and stencils for art journal pages and can be cut up for embellishments, etc. Lots of bling for the buck! Sooooooo beautiful!! LOVING those photos of Milo and loving the paws and hearts!!!!! Such a beautiful photo of your precious dog. Awesome page! LOVE this layout! I could easily substitute my Golden's photo in it! I love a good mystery and would love a mystery box! I love blues and neutrals and flowers but also pretty much anything and everything! Thank you for a chance to win! Sweet layout! Love the file and very sweet photo of Milo. Hmm... I think right now it is Heidi Swapp mists. I put it on just about every page I make. What a cute layout with a great photo and sentiment! I need to start scrapping more pet photos myself because I have a lot of them. (pets and photos!!) Loving the wood embellishment and fun cut file! Let's see, my favorite scrapbook products would be paper...of course, and stamps (I have been trying to stamp more on my pages), and dies. I don't have an electronic die cut machine...just the regular old fashioned Big Shot but I love it! Very sweet photos and layout!! My favourite product is probably patterned paper. I really like this cute overlay on your page and I can totally understand how you've been hoarding this adorable wood veneer embellishments! I LOVE a good mystery box, so thanks for the chance to win. My favorite products are a toss up between rhinestones and chipboard embellishments. Please tell me you did NOT sew around that wooden heart??!!!!! It's a lovely page....and scrapping really IS therapeutic! And thanks for the chance at your giveaway...my fave product ATM is enamel dots. And resin stars. And nail polish!!!!!!! To name a few. I could go on and on, of course;) !!!!!!! Love that cut file....and your layout is amazing!!! And my favourite scrapbook product right now is my Silhouette....I don't know how I managed without it! Loved that layout!!! My favorite product is Cameo - can't live without being able to draw or cut things with that machine!!! Thanks for the blog hop. I can see why you miss your dog. He looks very sweet. My favorite product is probably clear glitter glue. It's just so versatile. It adds wonderful dimension without the bulk. I love it for cards and layouts and all kinds of projects. I also like that it's so cheap. A little glitz adds so much. This cut file is so darn adorable! My favorite products right now are my Cameo and Glitter. The Cameo because it makes life so much easier, and glitter because my fella hates the stuff and the kids and I get a real kick out of taunting him by putting glitter on everything. He's a good sport about it, thank goodness! Must love dogs! I thought of that movie when I saw your dog layout. We love love love dogs! As far as favorite scrapbooking materials, I love enamel dots, all sorts of Thickers, and Project Life materials.